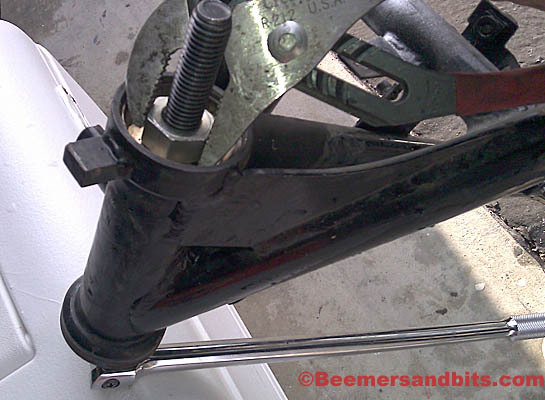 On the /5 BMWs, there is a chrome horseshoe that acts as both a fender mount and a lower fork brace. 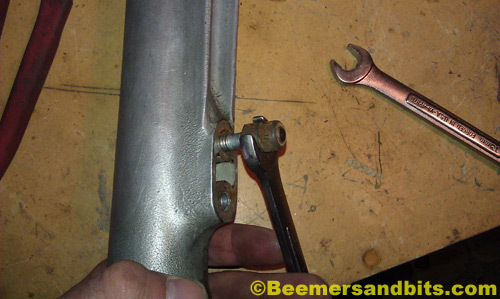 The studs that connect the fork brace to the fork sliders are part of the slider and can potentially leak. One of mine has slowly leaked on my /5 for years and i haven’t around to fixing it yet. 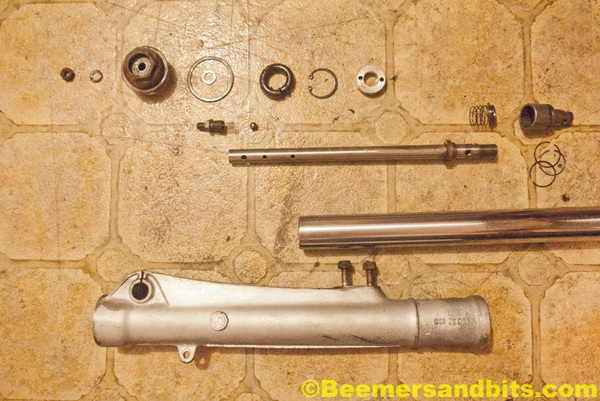 For this bike rebuild, i noticed that out of the 2 sets of fork sliders (4 sliders from 2 bikes), one leg was leaking terribly due to all the dried oil residue down the front of the fork slider.As i was disassembling the second set of forks, one of those studs came out instead of the nut coming off… so i got to thinking (and got some advice from some BMW pros), i should re-seal all the studs to be safe. 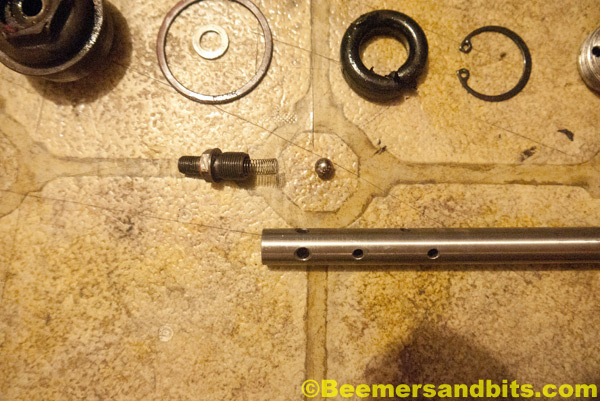 Fork slider with one stud removed, another about to be removed. Double nut to remove the old stud. Tighten these two nuts tightly together. 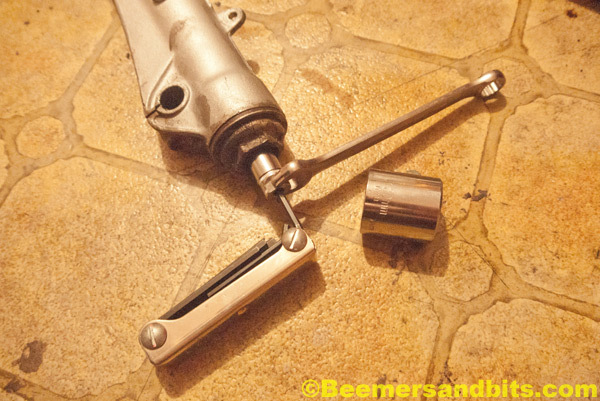 Loosen the lower nut and it will remove the entire stud. Inspect the threads of the studs. Out of the 2 sets of fork sliders, i had about 6 good studs. 2 were too rusty or bent to reuse. 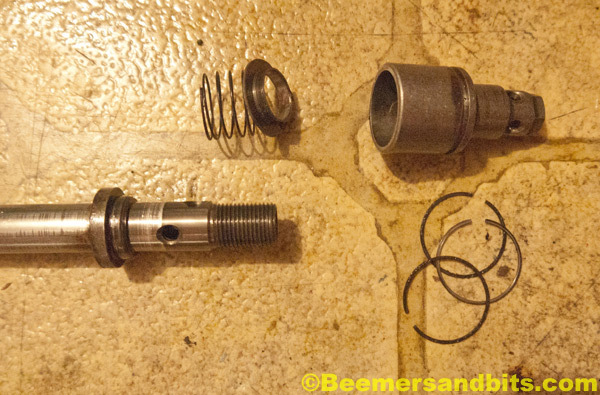 After inspection, i did a quick cleaning on the wire wheel to clean up the threads. 4 removed studs and red locktite. 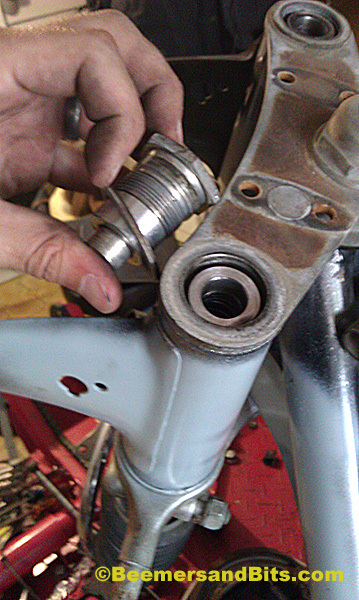 I then replaced the nuts on the longer threaded end of the studs. 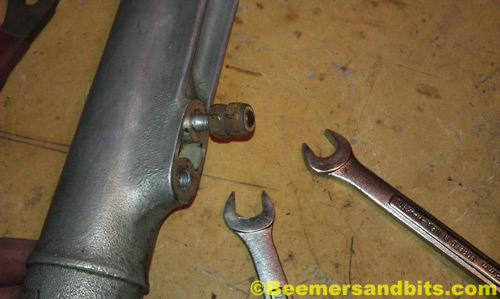 I pinched the middle part of the stud that is not threaded in a vice and tightened the nut as much as i could. 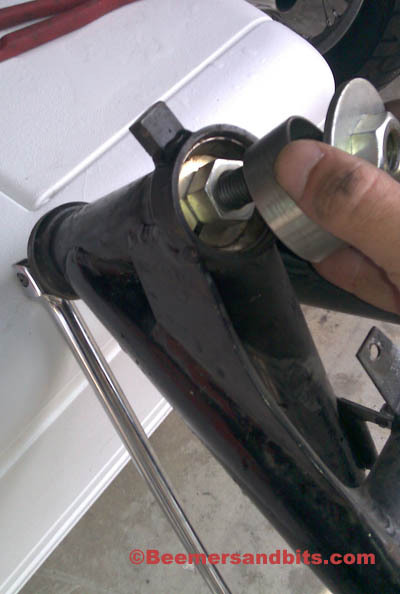 Then i wrapped part of the fork slider with a rag and clamped it in a vice. I used a heat gun to heat the fork slider to get the metal to expand. I spent a good amount of time heating the legs to a very hot temperature. 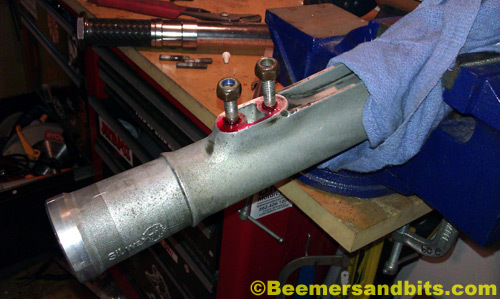 I then added red locktite to the threads of the stud and inserted the stud into fork slider by using the nut and a 13mm socket to tighten it into the slider. I went as far as i could, as fast as i could before the slider cooled down. 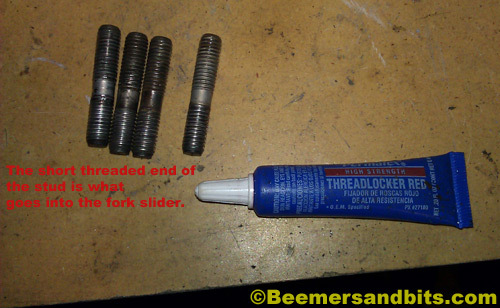 *** But please look into the fork slider (flashlight helps) and make sure you don’t drive the stud too far into the leg where it will hit the fork tube. 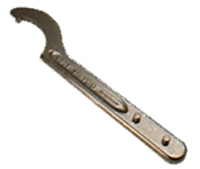 If the stud goes too far, it will prevent the slider from operating properly on the fork tube, or severely damage the fork tube. 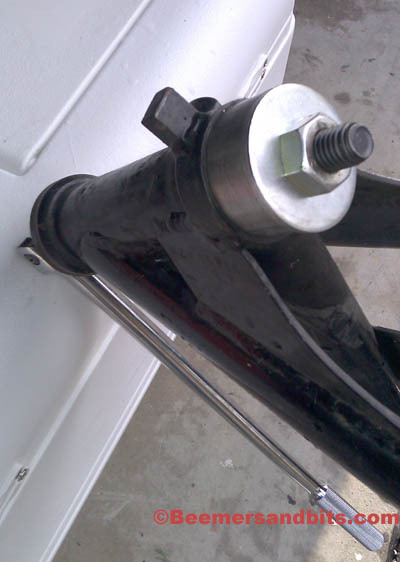 When the fork slider cools down, and with the use of Locktite, it should create a nice tight seal around the stud and not leak again. 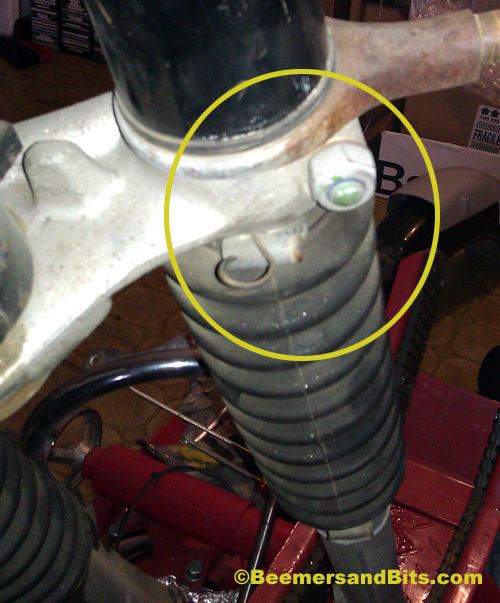 Tightened studs back into fork slider.I backed off the nuts from the stud and Yeah, i used a bit too much locktite. It looks ah-mazing. 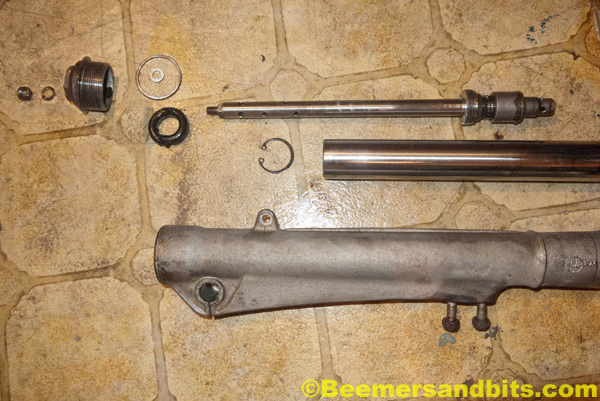 Having something so new and shiny really makes me want the rest of the bike to be new and shiny again. 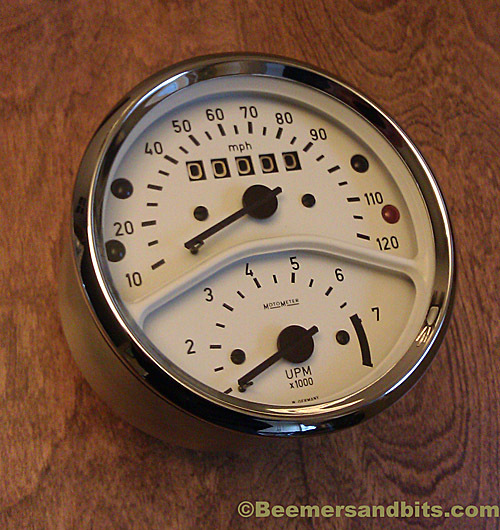 Since i am doing a complete rebuild on the engine, resetting the odometer to 0 was a must. I did the same on my last bike and Shane, the bike’s eventual owner did the same on a ’65 Porsche he had rebuilt. The white face will match the racing stripe up the center of the bike. I tried to give North Hollywood Speedo my business but a super rude person on the phone and slightly higher price sent me to Palo Alto Speedometer. Palo Alto was pleasant to talk to and deal with. Speedo before rebuild. Cracked needle. 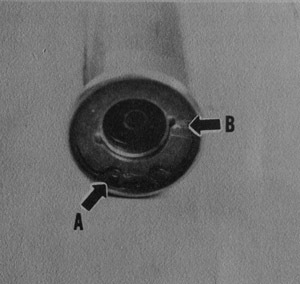 Dented bezel. 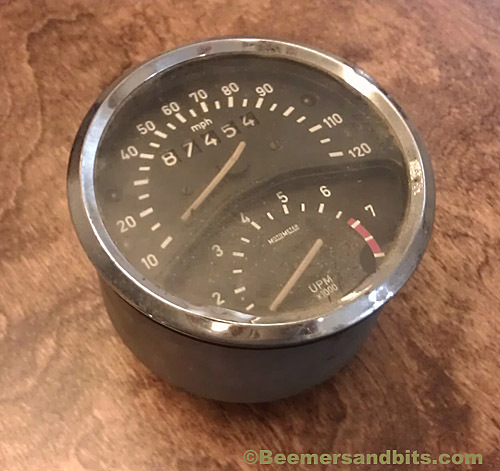 Speedo rebuilt from Palo Alto Speedometer. Custom white face installed. An amazing short film made in Ho Chi Minh City. Lots of crazy scooter/motorcycle transportation. 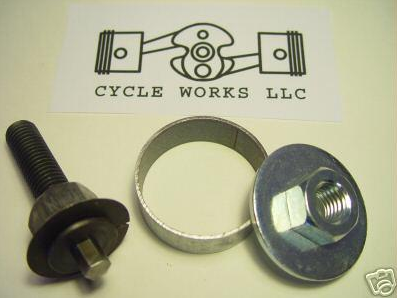 I finally broke down and got a race puller from Cycle Works. 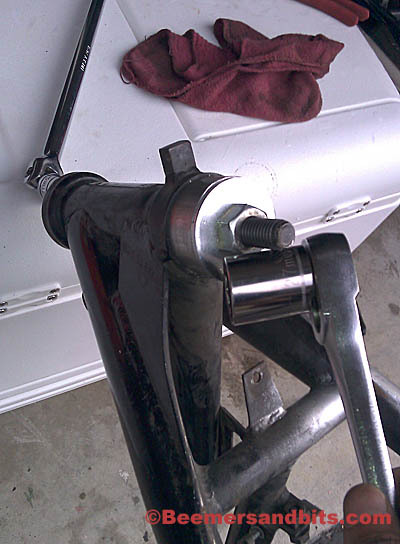 Here is a step by step on how to pull the steering bearing races from the neck of the frame. 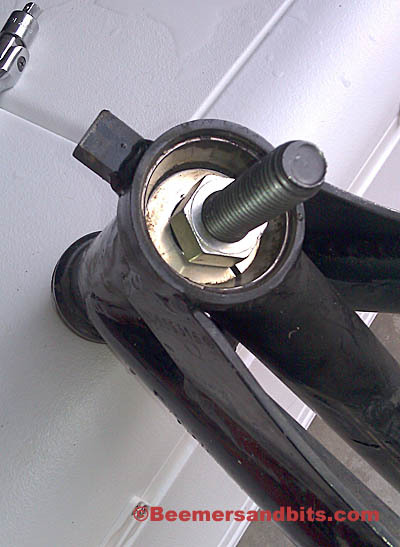 Note the way the split washer sits on the bolt. The washer needs to go behind the race. You may need to tap it into the neck. 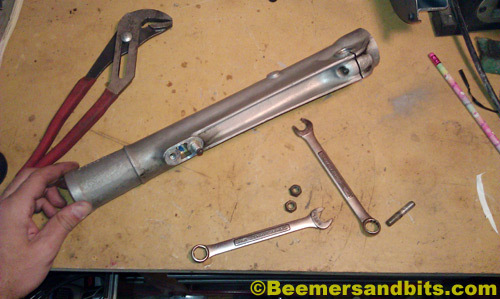 I had to use a few long sockets and extenders to reach the 10mm head of the bolt through the other side of the neck. 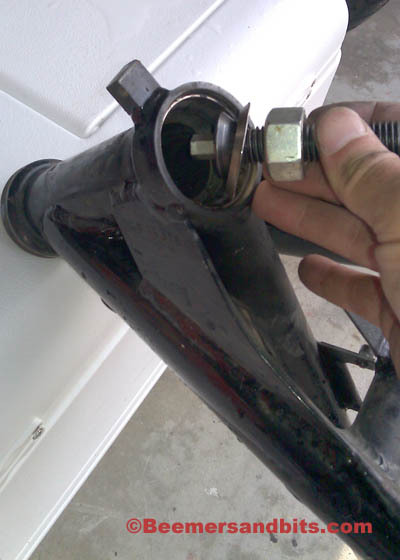 When you tighten the nut onto the bolt, it expands the split washer to fit tightly behind the race. This will help pull the race out. 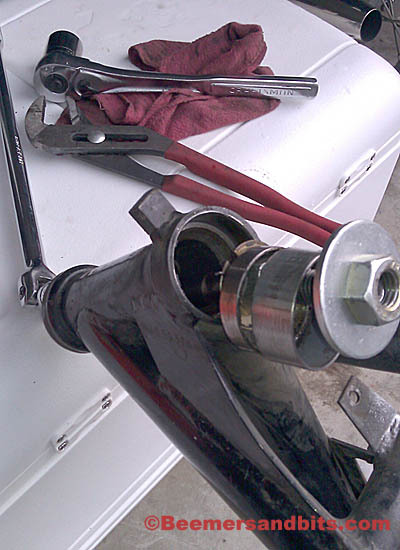 Insert the slice of tube(collar) and attach the nut with the large washer as shown. 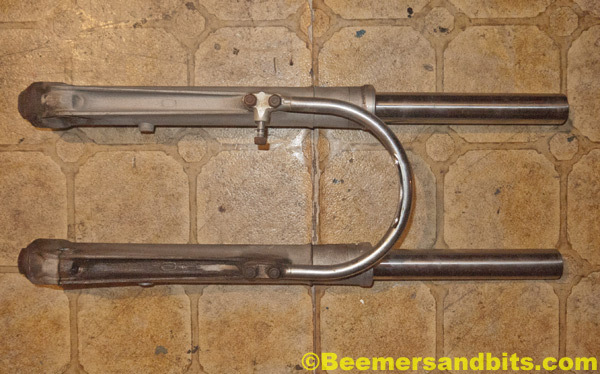 Make sure the piece of tubing sits centered on the frame aligned so the race can slide out into the tube. 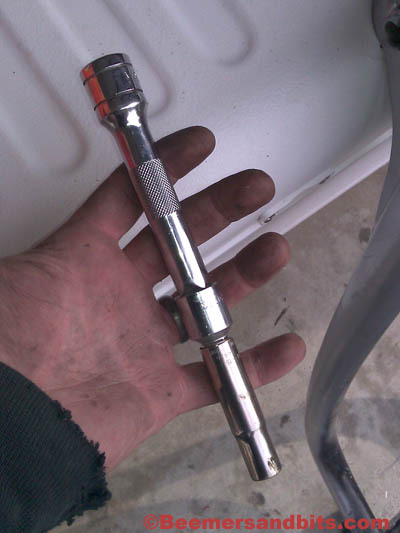 27mm socket to tighten the nut. 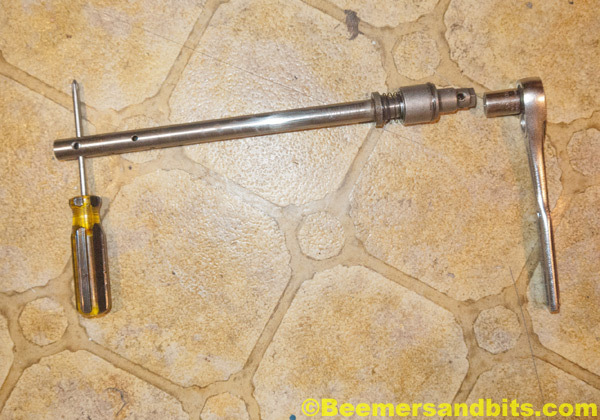 Breaker bar with socket extension through the neck attached to the 10mm nut on the bolt. After some torque and cranking, you can feel the race start to pull out into the collar. Eventually, everything will pop out as shown. Save an old race. Next time you use the tool, you can keep an old race in the collar to prevent the collar from warping, and to help guide the next race out.